This post is part of a serie on SEO for web designers, make sure you don’t miss any update by subscribing to the RSS feed. You shouldn’t wait for your website to be online to work on your SEO, planning ahead is the best way to take the right path to search engine optimization success. By analyzing the market, you will give the direction to your future website. Here are a few steps you should do before starting that new website. How will you optimize your website for search engines if you don’t know what keywords to optimize it for? Keyword research is a crucial step of SEO that is often overlooked. 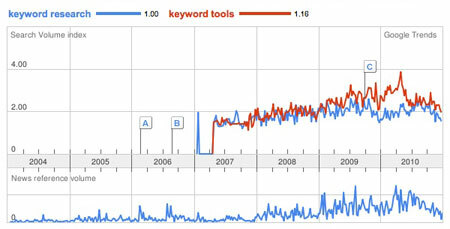 Google AdWords keyword tool: gives you approximate keyword search volume statistics for Google search network. Google Trends: use commas to compare multiple search terms. KGen: a Firefox extension that allows you to see what keywords are strong on visited web pages. Synonyms thesaurus: web resource for English synonyms, antonyms, and definitions. Keyword questions: find the questions people ask in search engines. dnScoop: get all kind of info about a website, includes a valuation of it. Reverse IP lookup: see what websites are hosted on an IP adress. Who is Hosting This: discover who is hosting any website. BuiltWith: get to know what tools have been used for building a website. Compete: gives you some approximate site statistics and traffic infos. You should never underestimate the power of a good domain name. Your domain name should be easy to memorize, as short as possible and… available. It could be tempting, but try to avoid a keyword-stuffed domaine name, only include a keyword in your domaine name if appropriate. To find the right domaine name, you can of course brainstorm and try to be creative. 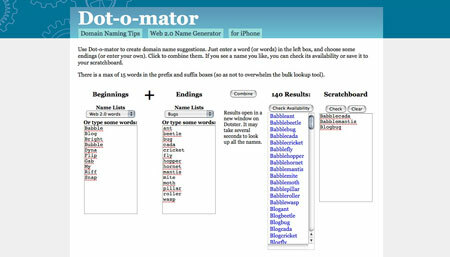 You can also go with one of the following domain name tools: Domai.nr, Dot-o-mator or BustAName. Google clearly stated that it values website that load quickly. Of course you can optimize your code to get a faster website, but ultimatly you’ll need a reliable web host if you don’t want to be penalized by search engines. There are tons of cheap web hosts out there, but you ultimately get what you pay for. Shared hosts such as Dreamhost or Hostgator provide great service for the price, but they do oversell and you don’t know who your ip neighbors will be. Bad ip neighbors can have a negative impact on your website’s ranking. For sure, you will find your Dream hosting someday. 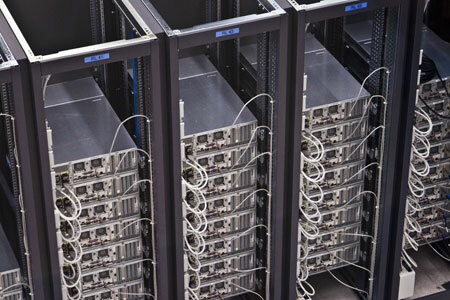 If you want to make sure that you will not have bad neighbors on your server, you can go for a VPS. Many hosting providers now have decent VPS offer, for $20 to $50 a month you can get your own ip adress and get better performances. If you are really serious about your website, you should go at least with a VPS, or even consider a dedicated host.